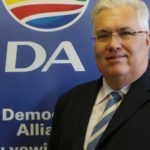 The safety of EMS personnel must be prioritised by the ANC-led government. Enough lives are being lost and too many traumatised by the poor ambulance service. A DA-led government looks forward to bringing real change by means of a safe and efficient health service to the people of the Eastern Cape. — Bobby Stevenson MPL, Shadow MEC for Safety & Security.